HoloLens may have applications in fields like health and education, but what about immersive sports entertainment? Microsoft is one step ahead of you. Today during a Super Bowl 50 event in San Francisco, the company showed off a proof-of-concept video of how it thinks the AR viewer can transform your Sunday watching rituals. The video runs through a number of possible features. One expands the field of view beyond the aspect ratio of your TV screen. Another has life-size holograms of NFL players bursting through your living room walls. 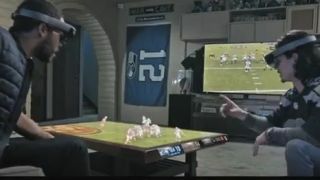 Yet another lets you view fantasy scores, while another lets you pull up an instant replay on your coffee table, complete with miniature-sized players running around. New Orleans Saints quarterback Drew Brees said at the event the ability to have a hologram of a player in front of fans would give them a sense of how big they really are, something they can't get a good perspective on when they're watching TV. Separately, Brees also pitched the idea of coming up with a way for fans to be "literally looking through my eyes" so they could see what he sees - or doesn't - as he makes plays. Brian Rolapp, Executive VP of Media, National Football League, said the league is "doing a lot of experimentation with" HoloLens, adding, "This stuff's coming." When that is we still don't know, but it would bring a whole new element to your weekly football game viewing.